87% of students who graduate from Bridging the Gap do not re-offend within a year. Our recidivism rate is among the best for similar programs. BRIDGING THE GAP MISSION: To educate youth on the resources and tools needed for them to make better decisions for themselves and ultimately attain a more promising future. In 1996, we initiated our Bridging The Gap Between Youth and Community Services program to serve court-involved and at-risk or high risk youth ages 12 to 17. This innovative program is designed to provide the support and skills youth need to keep their lives on track. The twelve-unit life skills curriculum, designed by The Salvation Army, focuses on either prevention or intervention. The program is offered at no cost to participants. Since 1996, the program has served over 6,000 youth throughout Massachusetts. 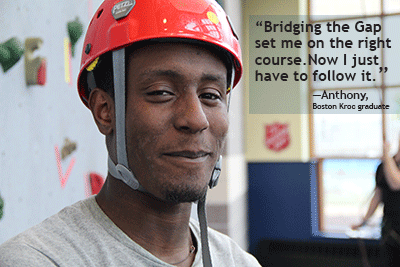 Today, Bridging the Gap is operating in 13 communities across the Commonwealth. Programs are placed where there is an urgent need to provide safe alternatives to violent and risky behavior in youth. Catching young lives at a critical juncture, we aim to significantly reduce the potential for court-involved youth to become re-offenders. Bridging The Gap is designed to provide youth with a foundation for reaching their personal potential and for positive interaction with the community at-large. The curriculum includes topics such as building self-esteem; how to deal with peer pressure; anger management and decision making; communication skills ; relationships with family members, friends, figures of authority; culture and diversity; violence and gangs; the effects of drugs and alcohol, job seeking and financial planning, legal issues and ethics. Teens also learn about the resources available in their community. A Christian attitude underlies everything we do. We also work to stabilize the family and youth through the crises of arrest and court appearances, and then work with them to address the factors that led to the arrest. READ MORE. Our Bridging The Gap programs work cooperatively and effectively with numerous other community agencies, including District Attorney's offices, local law enforcement, juvenile probation offices, Department of Youth Services (DYS) and Department of Children and Families (DCF), schools, corrections system, and volunteers to create a network of services aimed at keeping youth on track, keeping them engaged, and keeping them focused. Upon graduation, youth sent to the program through Juvenile Diversion programs with the District Attorney’s office may have their criminal records cleared provided they do not re-offend for one year. Bridging the Gap staff members and volunteers periodically meet with graduates and their parents. It is a blessing to report that, one year after graduation, 87% of program participants had not re-offended.